Summary. Primary extra-nodal non-Hodgkin’s lymphomas (NHL) constitute 25–40% of NHL but less than 1% arises in oral cavity. Here in 53-year-old man with stage IE gingival diffuse large B cell lymphoma who was treated successfully with chemotherapy and radiotherapy was presented. Abbreviations used: CT — computerized tomography; DLBCL — diffuse large B-cell lymphoma; NHL — non-Hodgkin’s lymphomas; PE-NHL — primary extra-nodal NHL. Non-Hodgkin’s lymphomas (NHLs) are heterogeneous disease and diffuse large B cell lymphoma (DLBCL) is the most common type which represents about 30% of all NHL [1, 2]. DLBCL is an aggressive lymphoma and like most NHLs, there is a male predominance. Although the most NHLs arise in lymph nodes, 25–40% of patients with NHL present with extra nodal involvement. 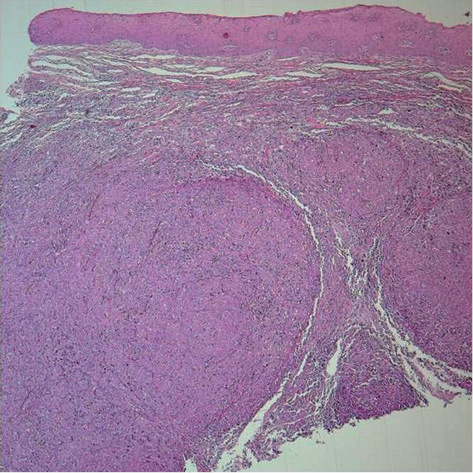 Whereas the definition of primary extra-nodal NHL (PE-NHL is a controversial issue, especially in patients with both nodal and extra nodal sites involvement. The incidence of PE-NHL is increasing worldwide [2–5]. Although NHLs can involve any organ and tissue, the most of PE-NHL arise from gastrointestinal tractus but in less than 1% of the patients the initial sites may be in oral cavity [3–6]. Patients with DLBCL typically present with a progressive enlargement of a mass, most usually lymph node enlargement in the neck or abdomen. “B” symptoms (i.e., fever, weight loss, night sweats) are observed in approximately 30% of patients, and the serum LDH is elevated in over one-half . In the extra-nodal disease, patients present with the concerned organ’s symptoms. As it can be difficult to diagnose and diffuse B cell lymphoma is aggressive in the atypical presentation the lymphomas have to be kept in mind. A combination of chemotherapies and the monoclonal antibody rituximab (R) can lead to a cure in a large number of people with this form of lymphoma. The most common regime is R-CHOP or CHOP for 6–8 cycles. Patients in early stages also benefit from radiation to involved areas [3, 6]. The purpose of this report is to demonstrate a case of extra-nodal DLBCL arising on the gingiva and to emphasize the difficulty of the diagnosis of the gingival disease not improved with routine dental treatment. A 53-year-old man was admitted to our clinic with 3 months complaint of teeth and gingival pain at December 2010. 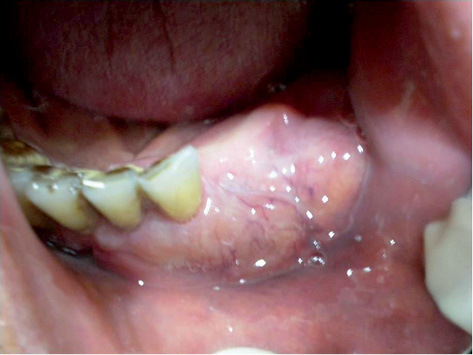 His teeth were pulled out after a course of antibiotic therapy but his complaints got worsened (Fig. 1). A gingival biopsy from the left premolar side was done by his dentist. 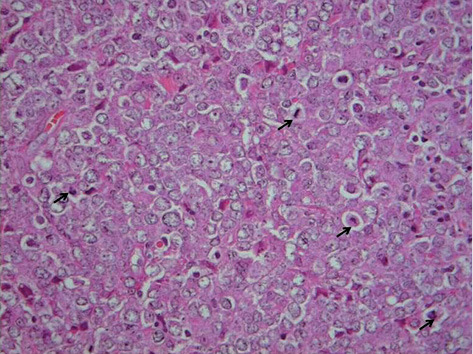 The histological examination of the biopsy revealed that a tumoral infiltration consisting of cells with large nucleus, prominent nucleolus and insignificant cytoplasm (Fig. 2 and 3). 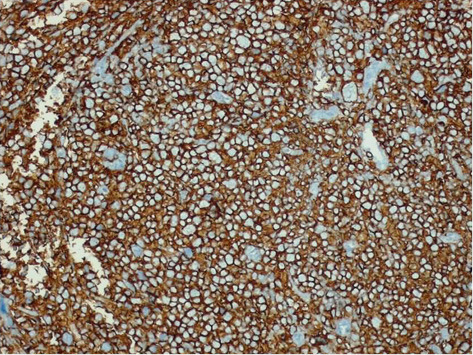 The immunohistochemical examination showed staining of tumor cells with CD45, CD20, and vimentin but S100, SMA, and keratin were negative (Fig. 4). He had a gingival pain, paresthesia at his chin on the administration. The physical examination and complete blood count, biochemical investigations, and chest x-ray were within normal limits. The patient’s beta 2 microglobulin level was 2 mg/L (normal range: 0,7–1,8 mg/L) and LDH and ESR was in the normal range. In addition, lymphoma infiltration was not observed at evaluation of bone marrow aspiration and biopsy. The computerized tomography (CT) evaluation of neck, thorax, and abdomen revealed no abnormality. The patient was treated with four cycles of R-CHOP (rituximab 375 mg/m2, cyclophosphamide 750 mg/m2, doxorubicin 50 mg/m2, vincristine 1.4 mg/m2 (for a maximal dose of 2 mg), and oral prednisone 100 mg/d on days 1–5) chemotherapy with a final diagnosis of stage 1E DLBCL. Following four cycles of chemotherapy, he was given a total dose of 4000 cGy divided into 20×200 cGy fractions to the involved field. After 4 cycles of CT and IFRT, complete response was achieved and the patient has been followed up for 18 months without any evidence of relapse. PE-NHLs of oral cavity usually presents with an asymptomatic gingival hypertrophy or a mass of tissue mimicking common oral and dental pathologic conditions. Therefore, the diagnosis of the lymphoma can be delayed. In our case, the patient had gingival pain so he had gone to a dentist and had some teeth pulled out. Because of the worsening symptoms a gingival biopsy was done, which showed the malign infiltration and its treatment led to a cure of a malign disease. 1. WHO classification of tumours of haematopoietic and lymphoid tissues. 4th ed. S.H. Swerdlow. 2008, Lyon, France. International Agency for Research on Cancer. 2. Flowers CR, Sinha R, Vose JM. Improving outcomes for patients with diffuse large B-cell lymphoma. CA Cancer J Clin 2010; 60: 393–408. 3. Krol AD, le Cessie S, Snijder S, et al. Primary extranodal non-Hodgkin’s lymphoma (NHL): the impact of alternative definitions tested in the Comprehensive Cancer Centre West population-based NHL registry. Ann Oncol 2003; 14: 131–9. 4. Chua SC, Rozalli FI, O’Connor SR. Imaging features of primary extranodal lymphomas. Clin Radiol 2009; 64: 574–88. 5. Zucca E. Extranodal lymphoma: a reappraisal. Ann Oncol 2008; 19: iv77–80. 6. Lal A, Bhurgri Y, Vaziri I, et al. Extranodal non-Hodgkin’s lymphomas — a retrospective review of clinico-pathologic features and outcomes in comparison with nodal non-Hodgkin’s lymphomas. Asian Pac J Cancer Prev 2008; 9: 453–8.